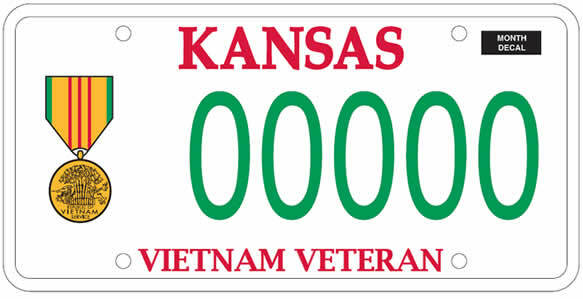 On and after January 1, 2012, any owner or lessee of one or more passenger vehicles, trucks of a gross weight of 20,000 pounds or less or motorcycles, who is a resident of the state of Kansas, and who submits satisfactory proof to the director of vehicles, in accordance with rules and regulations adopted by the secretary of revenue, that such person is a veteran of the Vietnam war, upon compliance with the provisions of this section, may be issued one distinctive license plate for each such passenger vehicles, truck or motorcycle designating such person as a veteran of the Vietnam war. Such license plates upon proper registration and payment of the regular license plate fee as provided in K.S.A. 8-143, and amendments thereto.